The basic question underlying NAC clinical trials is whether the repletion of available thiol groups will normalize lymphocyte glutathione levels, minimize cytokine-induced viral proliferation, and stop the CD4+ cell depletion associated with glutathione deficiency. Clinical trials to date contain only partial answers to these crucial questions. 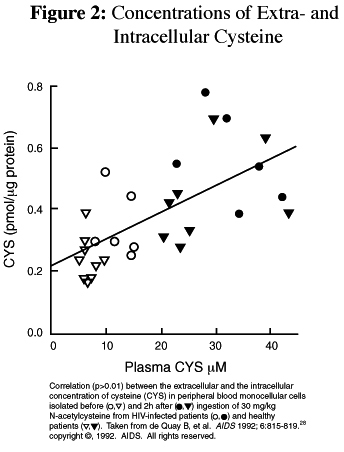 DeQuay et al  found significant reductions in cysteine and glutathione in all of nine HIV-infected subjects. Low baseline levels of cysteine in blood and in CD4, CD8 T lymphocytes, B-cells, and monocytes were returned to normal after a single oral dose of N-acetylcysteine (30 mg/kg body weight) (Figure 2). Glutathione levels were elevated four hours later in five of the nine subjects. The remaining four, who had the lowest baseline glutathione levels, each had less than 100/mm3 CD4+ cells and did not exhibit increased glutathione levels with NAC treatment. The authors commented that glutathione production in CD4 and CD8 cells was slow, and felt a longer period of administration would be necessary to adequately assess glutathione production. The study included an HIV-positive patient whose lymphocyte glutathione levels doubled after seven days of 600 mg NAC three times daily. However, NAC clinical studies have not been consistent. In one trial examining 45 HIV-positive men and women, taking 800 mg daily for four months, NAC was successful in normalizing plasma cysteine levels and significantly reducing TNF-a, but there were no changes in glutathione levels. Although none of the individuals was on an antiretroviral regimen, the median CD4+ count remained the same after four months while the control group had a significant CD4+ cell decline (p<0.005). The dosage was considerably lower in this trial (800 mg vs 30 mg/kg), which may account for the inability of NAC to affect glutathione repletion. Leonore Herzenberg and her group at Stanford  studied glutathione repletion in 27 HIV-positive men who were taking 3200–8000 mg NAC daily (median 4400 mg). This high dose was chosen because it was below a previously determined maximum-tolerated dose, and it was based on a prior erroneous study that indicated NAC had low bioavailability. At baseline, the average glutathione levels in uninfected controls were 28–percent higher than the HIV-positive group with CD4+ counts over 200. The NAC treatment group had a significant elevation in whole blood glutathione after eight weeks while the control group remained unchanged. The average increase in the NAC group was 113 percent, an increase that brought the treatment group close to the baseline of uninfected controls (Figure 3). The trial was continued for two years, even though the treatment group was only given NAC for 8–32 weeks (median 24). After two years, the NAC group (25 subjects) had a significantly greater chance of surviving than the group who never took NAC (p=0.002). The most beneficial information derived from this study, however, was the data relating glutathione levels and survival in those who had not taken NAC. In those with CD4+ counts less than 200, 85 percent of the 28 subjects in the high lymphocyte glutathione group were still alive after 2.5 years. Only 18 percent of the 69 subjects in the low glutathione group survived. Although the number of subjects on NAC treatment was too small to attach significance to treatment outcomes, there was a very significant relationship of glutathione levels to survival. Oliver  gave 15 HIV-positive individuals 600–1200 mg NAC daily for over six months. Peripheral blood lymphocyte apoptosis profiles were done at the onset and after six months of treatment. 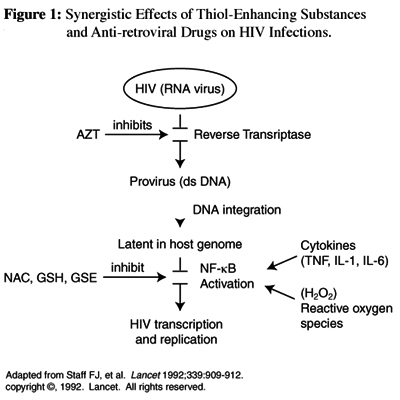 All of the HIV-infected subjects had evidence of significant apoptosis at baseline. The NAC subjects, however, had significantly less evidence of cell death compared to baseline, HIV-infected controls, and HIV-negative controls after six months. A study combining the effects of NAC (600 mg three times daily) and selenium in the form of sodium selenite (500 mcg daily) was designed to answer questions about the effects of these antioxidants on glutathione production, lymphocyte subsets, and viral load. Twenty-four HIV-positive, anti-retroviral-naive men and women (CD4+ counts 200–500/mm3) were randomized into two groups, one treated for 24 weeks and the other treated for the last 12 weeks of the study. A control group consisted of 25 healthy HIV-negative men. Baseline serum selenium and plasma glutathione (reduced and oxidized) levels were significantly reduced in the HIV-positive group. 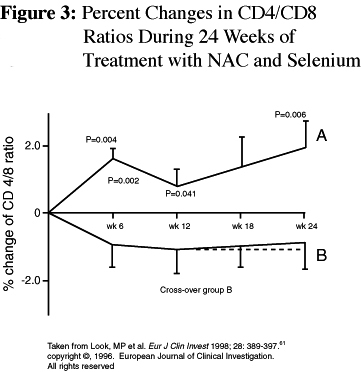 After six weeks of treatment, serum selenium concentrations increased by 53 percent and, although they dropped a little, remained at 45 percent above baseline for the duration of the treatment. Glutathione levels did not change in either group, but they were only measured at weeks 6 and 12. CD4+ percent (measured as a percentage of total lymphocytes) increased significantly in the first group at week 6 and week 24. Suppressor cell (CD8+) levels fell significantly within six weeks, (closer to control levels) and remained there for 24 weeks. Although the reduction of CD8+ cells is difficult to interpret, the increase in CD4+ percentage was significant; a falling CD4+ percent has been shown to be an indicator of faster progression to AIDS. It is important to note that viral load was unaffected by this treatment.